With all the variations in sports held throughout different countries, including the UK, it can be a challenge deciding which ones to call your favourites. For many, they simply have to include horse racing events with the Grand National being one of the highlights of their enjoyment. 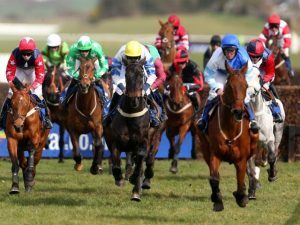 Flat horse racing in the UK holds its own aura of excitement but even those fans that are committed to this category of horseracing enjoy the Grand National which is a National Hunt Race event. This is a handicap steeplechase race that runs a four-mile distance. The horses are put through their paces with the requirement to jump 30 fences all within two laps. In 2017, the winner of this event was One for Arthur. No stranger to the Grand National Horse race event. He was trained in Scotland and to date, he is only the second horse that received training in Scotland to become a winner of this particular event. This horse is a bay gelding born in 2009. He has changed hands in ownership a few times but has been quite impressive during his career as a thoroughbred racehorse reserved for competing in the National Hunt Racing. He was sired by Milan and his mother was Nonnetia. The jockey who took One for Arthur to victory was Derek Fox and his trainer was Lucinda Russel. What makes this race so exciting is the challenges that both the horse and the rider have to face, not to mention the distance. Not only do the participants have to clear the hurdles once, but twice. A high level of concentration is just one of the demands that are placed on the horses as they cannot afford to be distracted. The sixteen fences that are part of the race are all topped with spruces. For the sake of safety, the original wooden fences have been replaced with materials comprised of plastic that allows for more flexibility when struck. Fans of the Grand National are filling with anticipation as they are looking forward to the 2018 event.